More excitement with new street art pieces found on the Shoreditch Street Art Tours today. In the morning we were able to inspect the new painting Cranio of Brazil completed yesterday evening. This characteristically colourful beauty features a host of partying rainforest Indians in a denuded landscape, flush with cash from the sale of their forest to the loggers, now what happened to that forest heh?. 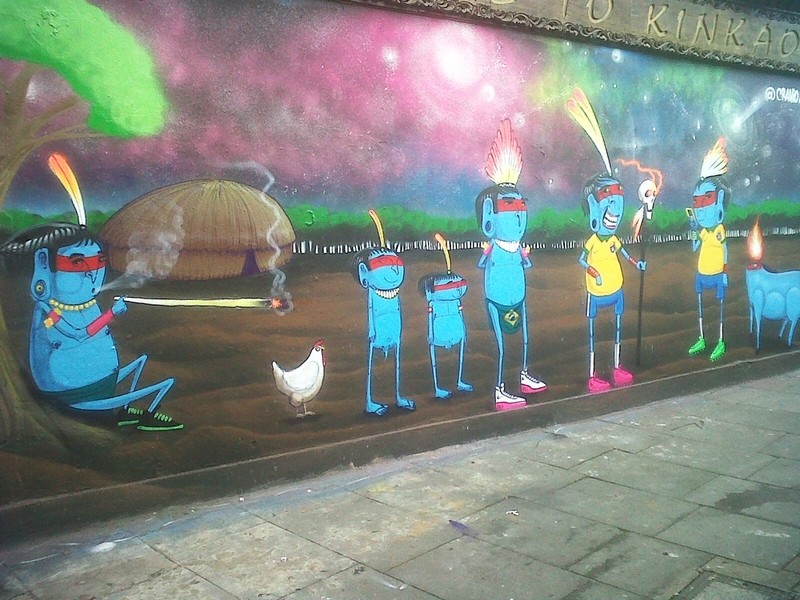 Cranio returned to Brazil today and certainly has left London streets a little bit brighter than when he arrived. We reported Art Is Trash’s previous fly poster hijack last week here, those fly posters were “collected” by persons unknown looking for some Art Is Trash material for their private collection. This entry was posted in News and tagged Art, Art Is Trash, Cranio, London, Shoreditch, Street on 09/12/2013 by Shoreditch Street Art Tours.